One of the most important, yet overlooked fundamentals of the golf swing occurs before any motion has started. I am referring to posture. Your posture has a significant influence on the direction and path the club will travel. Often there are compensations and swing faults made in the golf swing due to poor posture. 1. Let the hips tilt backwards or away from the golf ball. 2. Maintaining a straight spine, tilt forward from the hip sockets until it is approximately 45 degrees to the ground. 3. Unlock your knees and allow them to flex slightly. 4. Let your arms hang directly below your shoulders and just above your toe line. 5. Weight on the balls of your feet. Although golf is not generally referred to as a sport played by athletes, there are several similarities in the posture and athletic set-up for athletes in all sports. A good example is the linebacker in football. You will never see a NFL linebacker with his shoulders slumped over and weight on the heels before the snap. This would not allow for effective lateral movement needed to make tackles. Here are two of the most frequent posture faults that we see in our golf schools: 1. Bending from the ribcage instead the hip joints. 1. Too much bending from the ribcage makes for a rounded spine and affects the ability to pivot or transfer your weight correctly. 2. Excessive knee flex sets your weight entirely on your heels and leads to poor dynamic balance throughout the swing. Both of these faults will effect your swing plan with the most frequent being over the top and too steep on the down swing. 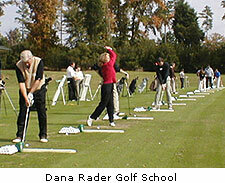 Posture Drill: Start by holding a club by the head end, lay it down your back with the grip end touching your tailbone. Keeping the club resting against your spine and back of your head while bending forward until your shoulders are directly above your toes. Finish the drill by flexing your knees slightly and balancing your weight on the balls of your feet. Maintain this position while flipping the club back in front of you into the address position. Do this drill before your practice sessions and you will soon develop a sound fundamental posture and will be on your way to building a solid, repeatable golf swing. i aM 14 years old and love to golf. Every time I tee off hit make good contact but the ball hooks to the right. Can you help me with this problem? as i was growing up, i loved golf and baseball, and i had the same problem as you did, so my dad gave me an example: when you bring the club back, hit the catcher in the mouth. With the driver I am hitting the ball either near the shaft,like a shank or hitting the ball at the top of the club,nowhere near the centre. I have tried standing further away,standing nearer,using a high tee, a low tee and nothing works. Can you help? This sounds like a problem I was having for a while. One way I found to fix it was that I lined the ball up in the center of the club face and on the backswing I imagined that I was trying to reach toward someone standing 45 degrees off my back shoulder. It really helped bring the club back in the proper alignment so I didn't hook or slice. I read the full story on posture control, and it sounded like some problems i was having. I read it over and over then went in my back yard, did the drill and started hitting in to my net. I didn't hit the ball thin once. It really helped.